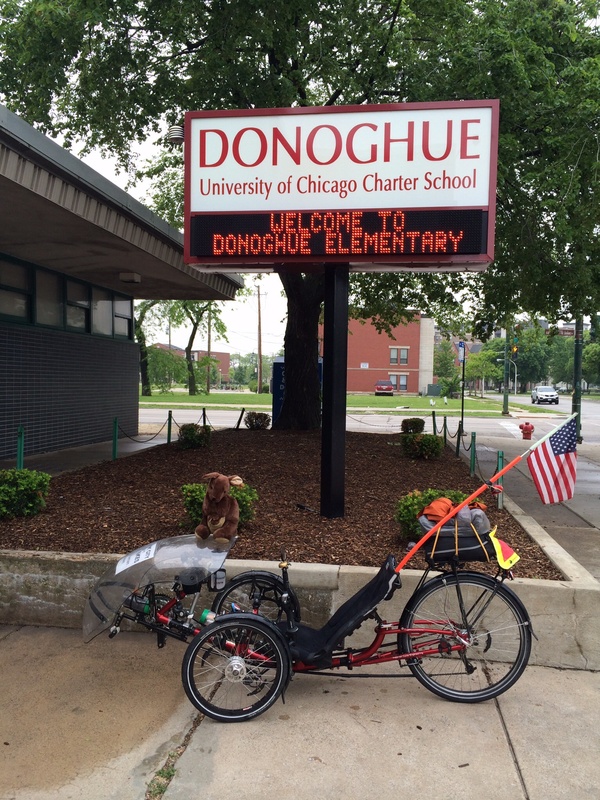 Today we rode 21 miles, from the North Side to the South Side, to talk to first graders and third graders at the Donoghue School. Much of our trip was along the Lake Michigan shore. 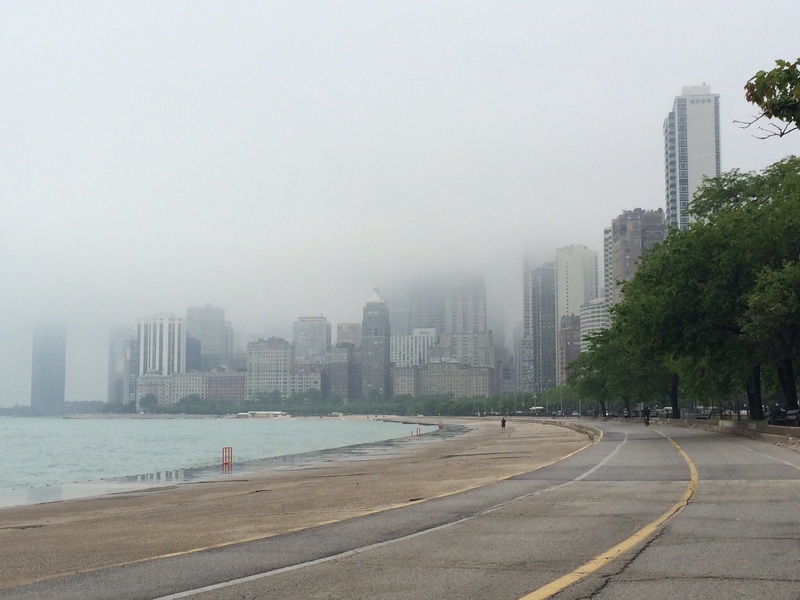 The remarkable Chicago skyline – Chicago is where skyscrapers originated – was befogged. 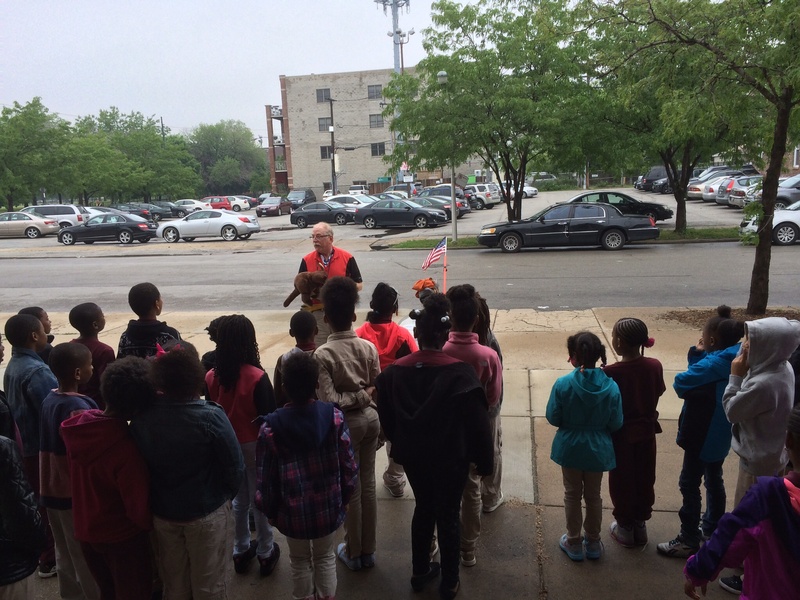 The children asked Jeffrey some of the same questions as adults, and some new ones. How long did it take you? (20 days.) How far did you go? (1555 miles as of yesterday.) Did you train before the trip? (No.) Do you get bored riding so many hours each day? (No.) Do you listen to music while you ride? (No.) Do you get sleepy? (Only at night.) Did you camp? (No, but I was prepared to sleep outdoors if I had to.) What if the trike broke? (I would fix it with the parts and tools I carry. But nothing broke, and I had no flat tires.) Why did you do it? (To help refugees, to explore, to talk to people and to learn from them.) How many lights are on the trike? (Six, and two more on Jeffrey’s helmet.) Et cetera. Jeffrey explained asylum and how important it is to have help to present one’s case; teacher Deena restated some of the concepts to be sure that even the first graders would understand. Can you please tell your dad thank you for coming to the school and sharing his stories. [My son] has not stopped talking about riding his bike all the way from New York. He wants to know how he can give some of his money to support human right cause. When a young person hears and understands, it gives one hope that one’s values and ideas will live on. It is a vote of confidence. It makes one’s day. That must be one of Deena’s rewards for teaching. We’re glad she shared her bright, energetic students with us. After leaving the school, we put the trike in a box for our planned rail journey home. We will be posting less often for the next few days. You will hear from us again no later than when we embark on our return to New York City, or when we arrive there early next week. This entry was posted in Asylum, Bicycle Touring, Freedom, Human Rights, Immigration, Recumbent bicycle, Recumbent bike, Tricycle touring by Joey. Bookmark the permalink. Congratulations on reaching Chicago! I have truly enjoyed reading about your journey. What fun to visit Deena’s class! The response from her student was so moving. You are indeed making a difference. Once again a magnificent ride pure guts and determination! Well done Joey and Jeffrey. Also beautiful photos with interesting interviews. We look forward to your next ride. Congratulations and thank you, Jeffrey! !